"I hate church. It's full of a bunch of hypocrites." This caricature of church as a gathering of a bunch of hypocrites is so overused that it has become trite. Yes, churches are full of flawed people, many of whom are trying to be good folks. I admit that I am one of those flawed, far from perfect people. Yes, we sometimes let immaturity, weakness, and rebelliousness sometimes get the better of us. The truth is, the place we often hate hypocrisy the most is when we see it in ourselves! When we come to Christ — when we confess Him as Lord and share with Him in His death, burial, and resurrection through faith in baptism — our lives are joined to Him (Colossians 2:9-15). Because of what He has done in His physical body on the Cross, God presents us before His throne as "holy in his sight, without blemish and free from accusation" (Colossians 1:21-22 TNIV). As we stand there drippin' wet, having received Christ and shared with Him in baptism, God chooses to view our imperfection through Jesus' perfection! The problem is that the Church is where the gap between our "drippin' wet perfection" collides with the "down to earth reality" of our failures, faults, and flubs. Our life in Christ is spent trying to live up to who we are because of God's grace (Colossians 1:23). When we share in Jesus' glory, we'll also share in the reality of His perfection (Colossians 3:3-4; 1 John 3:1-3). Until then, we are to focus on closing the gap between our "drippin' wet perfection" and our "down to earth reality" (Colossians 3:1-2). This is our journey to maturity, seeking after the perfection of Jesus in our day-to-day lives. One of the reasons God gives us spiritual leaders is to help us close this gap. 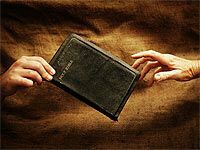 Their temptation, and ours as well, is to reach for a handy little list and say, "Here, do this and you will be godly." The reality is that rules, laws, and lists cannot help us close that gap. Yes, there are times when we need clear guidance on what is moral and not moral, what pleases God and displeases Him, but knowing that can't make us what we seek. In fact, trying to close the gap by such methods can end up making us what we do not want to be — hypocrites (Colossians 2:16-23). But if God gives us spiritual leaders to help us close this gap, what should we expect of them? What are their primary tasks as shepherds of our souls? God's leaders are to "strenuously contend" (literally, "labor agonizingly") to help us close this gap and present us mature, complete, and perfect in Christ (Colossians 1:28-2:5). Jesus must be the model, the message, the motivation, and the means to this goal (Colossians 2:6-15). The leader's task in this process is focused on three key areas. First, we need our spiritual leaders to point us to Jesus (Colossians 1:28-29), proclaiming Jesus to us, correcting us when we lose our passion for the character of Jesus, and teaching us the way of life of Jesus. This is not just helping us get to know data about Jesus, but actually helping us find practical wisdom to live like Him — with His values, His character and compassion. Second, our leaders need to help pray us to maturity (Colossians 4:12). Prayer releases the grace of God and the power of the Holy Spirit into our lives. When the content of a leader's prayers is shared with us, this prayer also furnishes spiritual direction, affirmation, and hope (Colossians 1:9-12). Read carefully the apostle Paul's prayers in the letters he writes to the churches. These prayers are powerful and offer great hope, affirmation, and direction to the followers of Jesus trying to close the gap! Third, spiritual leaders must depend on the power of Christ to do what they do (Colossians 1:29). Human leaders are no match for the power of the evil one trying to distract and destroy Jesus' work in our lives (Ephesians 6:10-12). We need to see God's power at work in our leaders' lives so we can trust it is at work in our own. I want to challenge you to pray and to call for your spiritual leaders to stay on task! So often, we want our spiritual leaders to do nothing more than act like our church customer service department and fix every thing we don't like or appreciate. Let's not let the devil, and our culture of consumerism, distract us from the goal, being like Jesus. Let's call our leaders to a higher calling so they don't have to waste their efforts on surface issues, but help us find our substance in Christlike living. We often want our leaders to be the church customer service department. Do you think I'm off base when I suggest that we expect our spiritual leaders to be the customer service department of our churches? Clearly there are other things leaders do to "shepherd our souls" other than these three things from Colossians. What one other thing has a leader done to bless your walk in the Lord? Reading Hebrews 13:7, 17, 24, what should we do to help honor and encourage godly leadership in our churches? "Agony to Maturity" by Phil Ware is licensed under a Creative Commons License. Heartlight encourages you to share this material with others in church bulletins, personal emails, and other non-commercial uses. Please see our Usage Guidelines for more information.